"That could be hard come nightfall. I have a ceremony to attend that starts at the setting of the sun, and doesn't end until well after moonrise. Plus, tonight is the supermoon." "Don't I know it," he grumbled. "You're not getting rid of me though. If anything, you'll need me more. Go through the ritual with me now, so I understand what's going on. I'll stay hidden in the trees, watching and guarding." "I can't. It's ancient, and precious, and can get us both killed if caught." "Then I guess we better not get caught." Click here to read a review of this story. 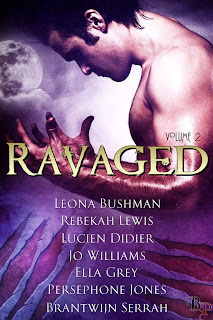 Click her name to see her special blog post about this story in the Ravaged Anthology.